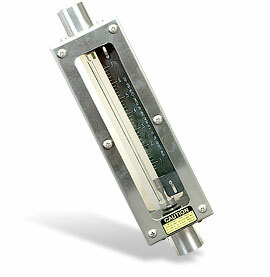 Rotometer for air and water applications. Minimum flowrate is 10% of maximum. Weights and maximum pressure shown are for both water and air models. For a 5-point NIST Calibration certificate, add suffix "-NIST5" to model number, add $375 to price. For a 10-point NIST Calibration certificate, add suffix "-NIST10" to model number, add $450 to price.